Home » Transformers » TFsource SourceNews - BIG AUTUMN SALE, Masterpiece, Ori Toys and More! 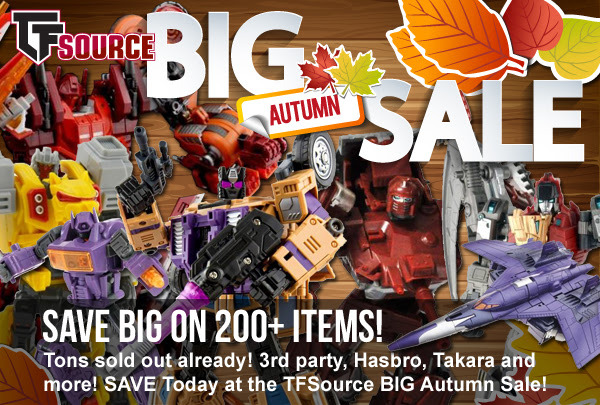 TFsource SourceNews - BIG AUTUMN SALE, Masterpiece, Ori Toys and More! TFsource's BIG Autumn Sale is now up! 200+ items, tons sold out already... 3rd party, Masterpiece, Hasbro, Takara check it out here: TFsource - Your Source for BIG Savings! TFsource - Your Source for Perfect Effect Combiner Add-on Kits! Toyworld's Masterpiece Scaled Construction Combiner - Now up for preorder! Standing an impressive 20"/50CM in its combined form, and individual bots featuring movable tracks, LED lights and more. Preorder this beast of a figure today at TFSource! Now Instock - BadCube - OTS-05 Claymore, OTS-06 Hypno, and OTS-07 Kickbutt - Collector Editions! These verisons includes die-cast metal, chrome, transparent color chest, as well as a weapon and energy cube with each figure. Pick up all 3 today! Check out our sister site theToySource.com for these great new instock items!